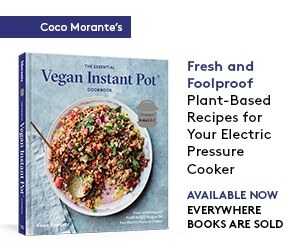 I am so excited to announce that in just one month, my vegan Instant Pot cookbook will be hitting the shelves. Isn’t that cover just gorgeous?! The book is currently available for pre-order for 32% off the list price(! ), so you can go ahead and reserve your copy on Amazon now. 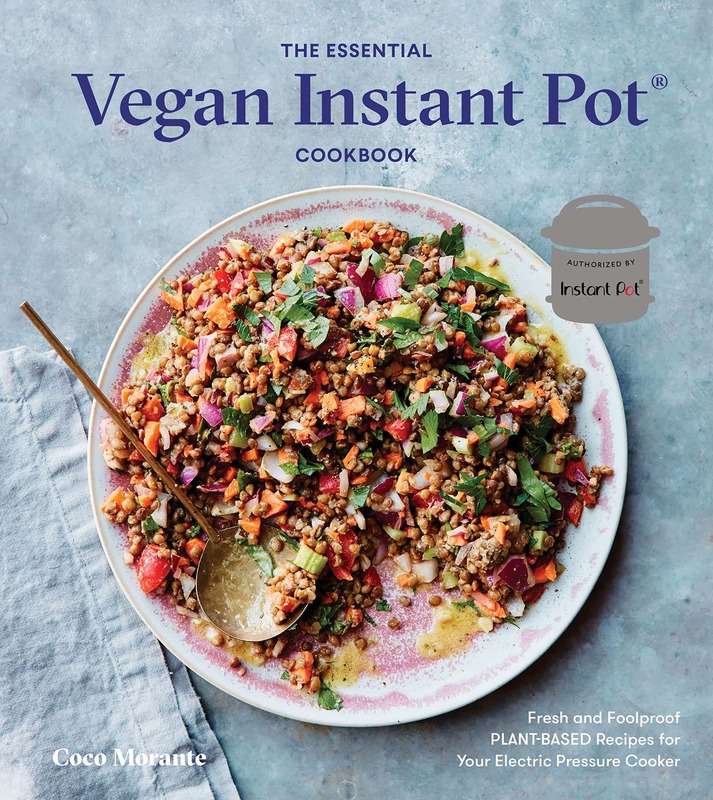 The Essential Vegan Instant Pot Cookbook was a joy for me to write. I got to reacquaint myself with my love for vegan cuisine in all of its plant-based glory. My brother and I were vegan in high school and college, and I still love to eat that way much of the time. It has been so fun to explore vegan cuisine once again, this time with the supercharged pressure cooking power of the Instant Pot! I wrote this cookbook for everybody — vegans, vegetarians, and those looking to incorporate more meatless meals into their weekly rotation can all enjoy it. There are chapters for every meal of the day, so you can pick and choose how you want to make vegan recipes a part of your life. The book starts off with a chapter of breakfasts including probiotic-packed smoothies and hearty porridges, and that’s just the beginning. I truly believe everyone will find something to love in this cookbook. My favorite part of the process was going to the photo shoot, where my food stylist could not stop stealing bites of Mac ‘n Trees, Tomato Soup with Welsh Rarebit Toasties, and Chocolate-Peanut Butter Cheesecake. There are so many flavor-packed dishes to savor, and I can’t wait for you all to try them, too! Right now, I want to chat with you a little bit about vegan yogurt, then share a recipe that’s not in the book at all! In fact, the yogurt recipe in The Essential Vegan Instant Pot Cookbook contains 5 ingredients, not 2. This is because I wanted *anyone* to be able to make it from ingredients you can find or order no matter where you live. No specific brands are listed or required, and any non-dairy milk will work. The recipe I’m sharing today, however, is very brand specific. It’s a recipe/method that’s arisen as they can only in the Facebook-iverse, from a vegan Instant Pot recipe group I belong to. 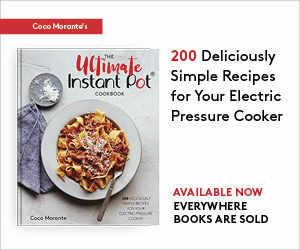 If you’re not hanging out in facebook Instant Pot groups yet, I urge you to come join in the fun! The one I run is a more general-interest group, but I belong to lots of other ones, too. The members of the vegan group from which this recipe originated frequently post their yogurt methods and experiments. It seems like for the last couple weeks, this 2-ingredient, soy-free yogurt is all anybody can talk about and make. And so, even though I’m knee deep in recipe development, of course I had to try it for myself to see what all the fuss was about! … and that’s it! The yogurt comes out very thick and smooth in texture, owing to the pectin in the yogurt and the various plant-based stabilizers and thickeners in the Ripple® milk. Oh, and people have done versions with the chocolate Ripple® flavor, too. You can really make it your own, choosing between sweetened or unsweetened varieties of Ripple® and Almondmilk yogurt to end up with something that’s either closer to a dessert-like pudding or a tangy yogurt. 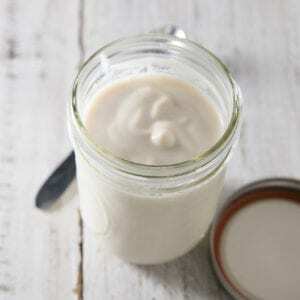 It’s a great entree into the world of vegan yogurt, since it’s so easy and predictable to make. Before you culture the milk, you’ll heat the Ripple® milk on the stovetop a bit, just to take off the chill of the fridge. I like to use a thermometer to make sure the milk is warmed to the ideal temperature for yogurt cultures to thrive, between 110º and 115ºF. While I’m doing this, I start the Instant Pot’s Yogurt setting, so the pot starts getting warm and cozy. 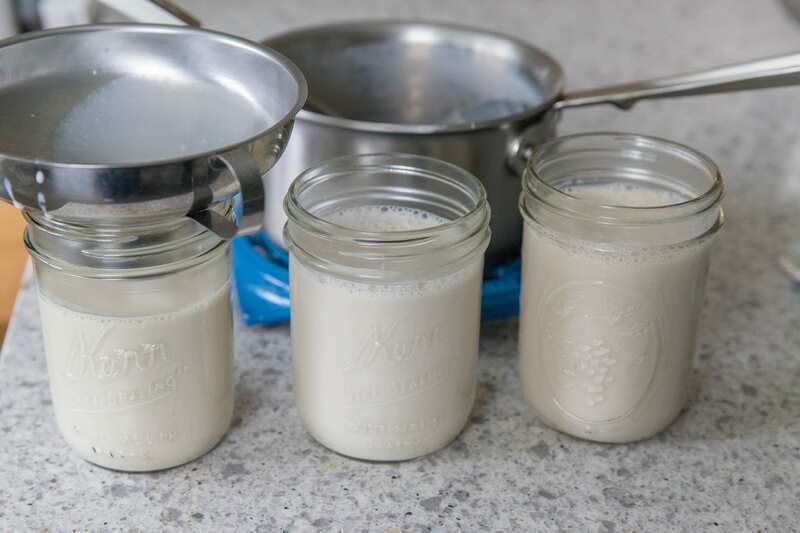 Once the milk is warmed, you simply whisk in the yogurt starter (in this case it’s a container of store-bought almond milk yogurt), then add everything to the Instant Pot and leave it to culture, for 8-12 hours depending on how tart your like your yogurt. I actually found that my yogurt had set up properly 6 hours in, but I left it a little longer so it’d get a bit more tangy. 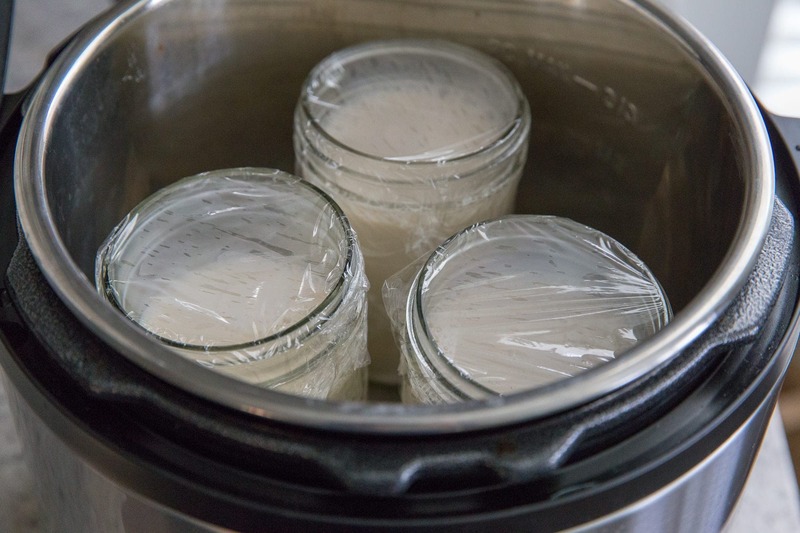 You can culture the yogurt directly in the Instant Pot’s inner pot, or in individual jars or other heat-proof containers, whichever you prefer. I like to use widemouthed mason jars or Pyrex round glass containers, since you can move them straight to the fridge when the yogurt is cultured, with no extra clean-up required. 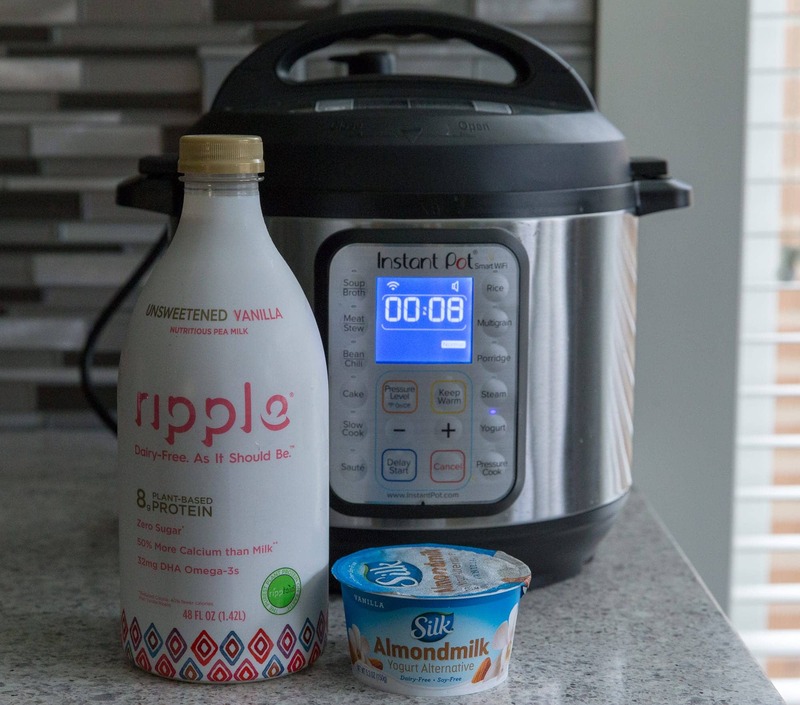 Whatever container you use, keep in mind that if your Instant Pot’s sealing ring has retained any odors, they may end up transferring to the yogurt. To prevent this, I cover the jars with Saran Wrap. If you prefer to leave the jars open, you may also just remove your Instant Pot’s silicone sealing ring when culturing yogurt. You’ll want to time your culture so that when the time is up, you’re around to chuck the yogurt in the fridge to cool. So if you start your yogurt at say, 8 in the morning and let it go for 12 hours, it’ll be ready to chill at bedtime, then serve for breakfast the next day. And that’s really all there is to it! I hope you enjoy this as much as I did. It’s a rich, thick, yogurt, great topped with fruit and/or granola or blended into smoothies. Let me know if you try this method, or the recipe from my upcoming book once it’s out. Wishing you lots of joyful, plant-based Instant Pot cooking! 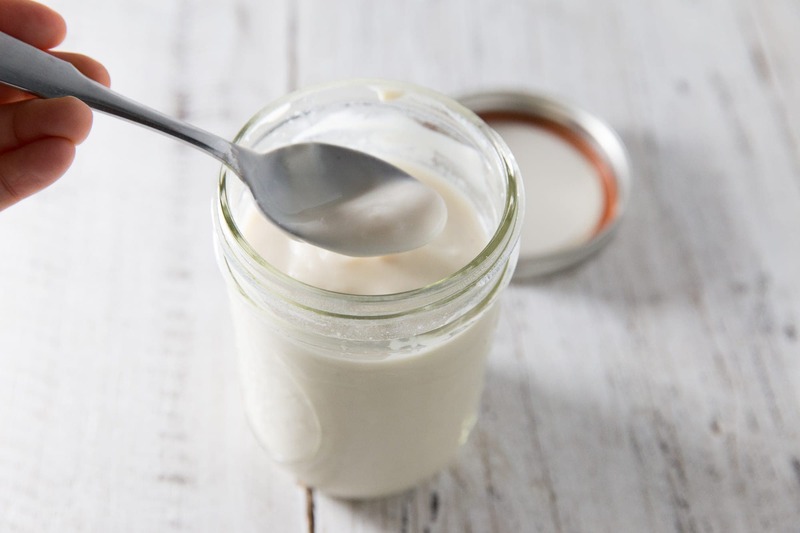 The simplest, easiest way to make vanilla yogurt in the IP. Select the Yogurt setting on the Instant Pot and place three widemouthed pint jars or one 7-cup Pyrex storage container in the pot. 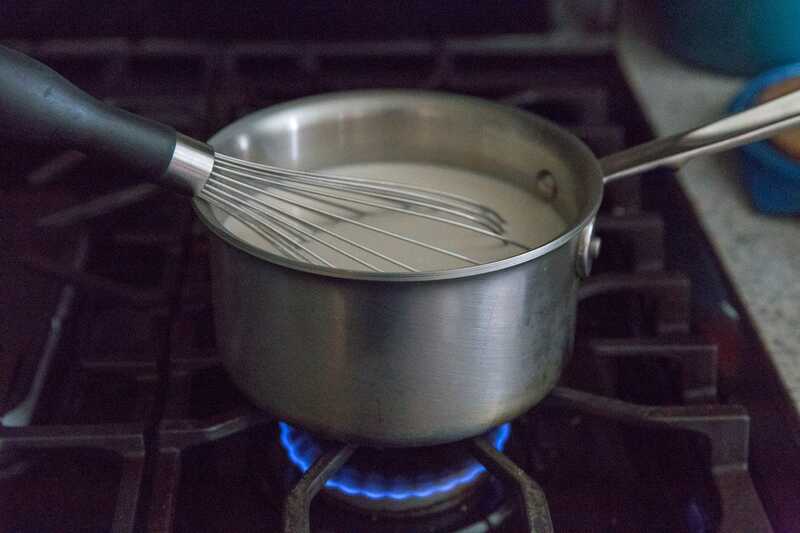 Pour the Ripple® milk into a medium saucepan. Heat over medium-low heat, whisking occasionally, until the temperature reaches 110-115ºF. Immediately remove from heat. 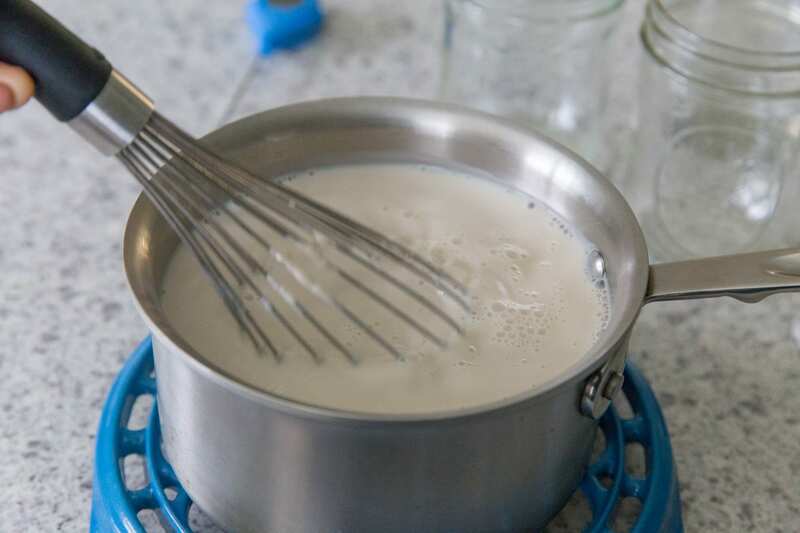 Whisk in the container of Silk yogurt until it is thoroughly blended into the Ripple milk. Remove the widemouthed jars or Pyrex from the Instant Pot, and ladle the mixture into them. Cover with Saran Wrap and lower into the Instant Pot. Reset the program on the Instant Pot, reselect the Yogurt program, and set it for 8 hours for mild yogurt, or 12 hours for tangier yogurt. When the cooking program ends, transfer the cultured yogurt to the refrigerator to chill. Let chill at least 8 hours before serving. Any suggestions for converting cook times for cakes steamed in an oven? I want to make Sticky Toffee Pudding Cake from an America Test Kitchen recipe that makes eight six ounce ramekins. I have a 6-qt Viva Instant Pot that will only hold two ramekins this size so I am dividing the recipe by 4. The recipes calls for 40 minutes @ 350° in a Bain Marie. Love your books. They are the most definitive I have found. Thanks for any help you can give me. Thanks so much for your kind words — If you’ve got time to leave an Amazon review I’d really appreciate it!😀 The timing will depend on how much of the batter is in each ramekin — cakes and other pot-in-pot foods tend to rise in temperature from the bottom up in the IP, so the thickness will determine how long it takes the batter to heat through. I’d start with 20 minutes with a 10-minute natural pressure release, then use a probe thermometer to check for doneness. If it has reached 200F in the middle, it’s done! 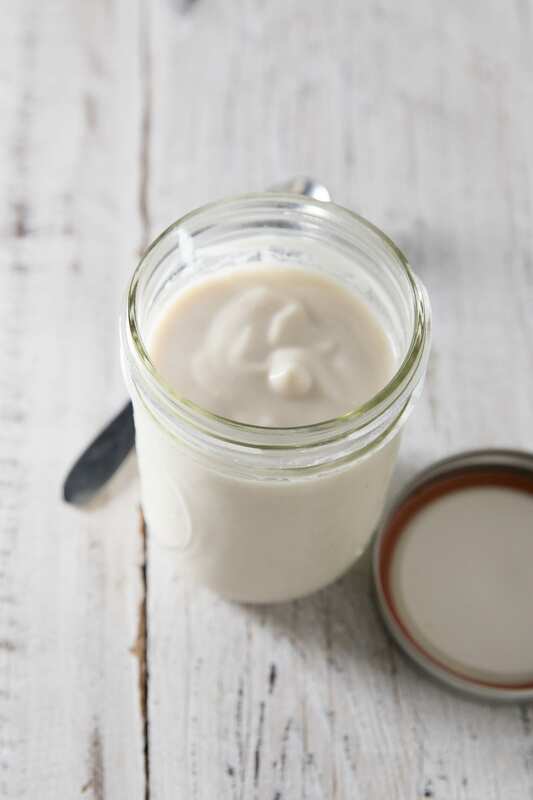 Do you ever use your batch of yogurt as a starter for your next batch or just use the almond milk yogurt every time? Can you use a yogurt starter in lieu of the container of silk almond yogurt? This question has nothing to do with yogurt but about the Lemon Poppy Seed Breakfast Cake in the Essentials cookbook, which I love! The directions say to use a 7 inch bundt pan but the picture does not look like the cake was made in a bundt pan. Can’t you just use a 7 inch cake pan? Thanks!